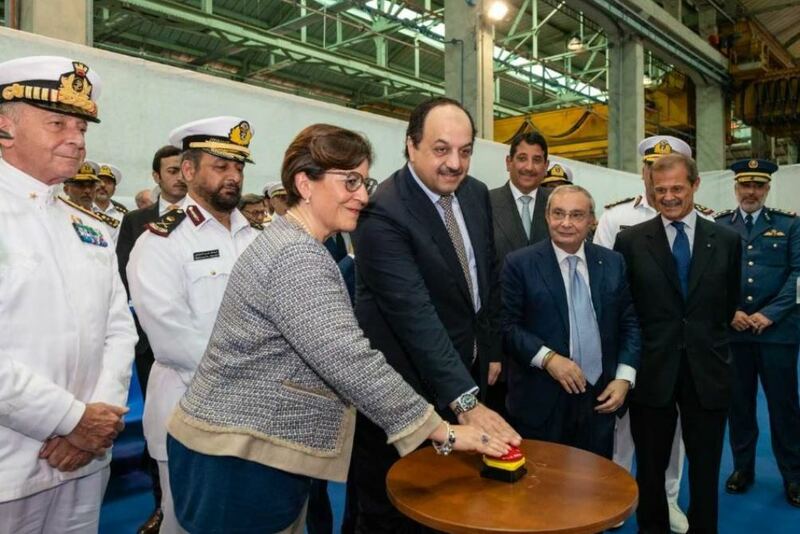 Other attendants of the ceremony were the Staff Major General Abdullah Bin Hassan Al Sulaiti, Commander of the Qatar Emiri Naval Forces, and the Chief of the Italian Navy Admiral Valter Girardelli. Under the contract at the amount of about EUR 4 billion, Fincantieri shall deliver 7 surface vessels – 4 corvettes, 1 amphibious vessel (LPD – Landing Platform Dock), and 2 patrol vessels (OPV – Offshore Patrol Vessel), including support services in Qatar for 10 years after the vessels are delivered. All the vessels will be built in the shipyards of Fincantieri in Italy starting from 30th July 2018. The first “Doha” class corvette is developed in accordance with the RINAMIL rules and will be capable of fulfilling various tasks, including surveillance, rescue operations, as well as warfare. The length of the vessel is 107 m, and its width is 14.70 m. it can reach the maximum speed of 28 knots. It will be have a combined diesel and diesel turbine plant (CODAD). The capacity of the vessel is 112 persons, of whom 98 – crew members. The flight deck and hangar are designed for one NH90 helicopter.